These are already available on Spotify. I guess I had never heard the Dadwater CD/Spotify version of Oxygene 8 before, because it really is horrible with a "flanger-like" deterioration in audio quality going on throughout the track (noticeable on the LP version as well, sure). [EDIT] Come to think of it, there's something like that going on even in the 1997 LP version, but I guess it just sounds really blatant in the 2010s remasters. There's an excessive amount of white noise on Oxygene 7 too. These are already available on Spotify. I've tried to compare the 2018 Spotify GOL with the GOL 2003 CD just by playing side by side and shifting input signal with my Marantz remote control. The Spotify version sounds more narrow in channel separation and much thinner, even if I try some Dolby dynamic tricks with the signal. Not sure if this is good or bad but as a listener I smile more with the old CD in my headphones. Pretty much the same happens with the Metamorphoses album. Can't imagine what they would be like as vinyl (half speed mastered) LP's. The CD player is a Denon DVD/(dvd-audio/sacd/hdcd) CD-player from 2004. I wasn't joking. I don't know what they did, but there's really a lot more white noise on the album. Oh ok then. I thought you were referring to the "wind effects" basically created from an EMS VCS3's variable white noises. For me there's a different story with the new Spotify release of Oxygene 7-13. It sounds brighter and more treable'ish then my original CD. The old CD is more muffled and the new mix somehow open things up a bit. Possibly the best version of 7-13 I've heard so far. The tiny *ticks* here and there are even more present now. edit/ I just bought the 2018 CD version from Amazon. Lets hear what it's really all about. 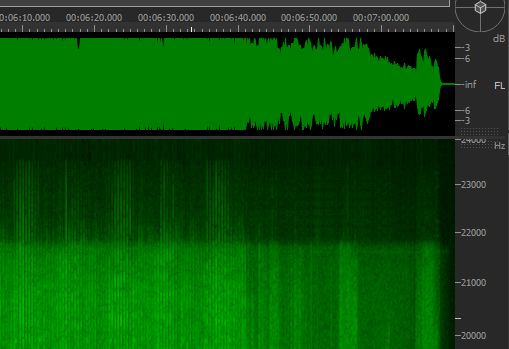 but there's really a lot more white noise on the album. Same as the trilogy 2016 release or worse? That one had clicks and pops in Oxygene 9 and some of the opening solo notes of Oxygene 7 were distorted. wind effects" basically created from an EMS VCS3's variable white noises. Joking aside, in Oxygene 6 (2016 for instance) they no longer sound like wind. They sound like white noise. Thanks to "precious ears". On Spotify they match each other perfectly and also with my CD from the Oxygene Trilogy box. It's just a question if these music files have the same mixing as on the 2018 CD? So the new releases of Geometry and Meta are both... Meh? Curious to know too. Also, if there's changes in the artwork for all three albums, except for the covers. An other new thing about these releases is the fact that they are now downloadable in 24 bits / 48 Khz Hi-Res audio format for my (Sony) Hi-Res walkmans. Strangely enough the new Oxygene 7-13 is only available in CD quality. I still like the "Oxygene 10 playing at the beginning of Oxygene 7" unintentional easter egg... sort of gives it a "humane" touch (in the vein of that random phone ring in the middle of "Rock The Casbah", IIRC). @locobo Man that looks horrible. Strangely enough the new Oxygene 7-13 is only available in CD quality. They're probably too lazy to make a new remaster. Go with the latest, change the graphics a bit and cash in the money. That's Sony.